The mission of the SPCA is to create a caring and kind community that encourages fair and humane treatment of all creatures. Our knowledgeable, caring, and open-minded team of staff and volunteers achieves that mission through proactive efforts to address the current status of animals in our community, education of adults and children, rescue and sheltering of animals in need, and placement of animals into appropriate homes. The SPCA does not receive any funding from the county, city, state, or federal governments. Our humane society does not receive tax dollars of any kind . . . we’re only able to assist the people and pets in need thanks to donations. The SPCA cares for more than 12,000 animals each year through programs that include adoptions; admissions; animal rescues; animal emergency transports; stray lost and found services; animal cruelty investigations and seizures; care for wildlife, reptiles, exotics, and farm animals; and much more. Animal admission fees enable us not only to provide continued care for surrendered animals, but allow us to help more and more animals every day. There is not an adoption time limit at the SPCA! Thanks to the tremendous community we serve and to thousands of generous donors, the SPCA has a new state-of-the-art shelter at 300 Harlem Rd., West Seneca, NY, and several off-site adoption locations! The SPCA Serving Erie County is one of few humane societies in the country with an on-site surgical suite for shelter animal sterilization, surgery, and overall care; in addition, in 2018 we opened the Stanford & Judith C. Lipsey Clinic at the SPCA, a low-cost veterinary clinic providing basic animal care and surgical procedures to owned animals. The SPCA Serving Erie County opened its doors on April 4, 1867 – in 2017 we celebrated our 150th anniversary! We’re the second-oldest humane society in the country (second only to the American SPCA, which is not a national SPCA “headquarters,” but a completely independent organization. 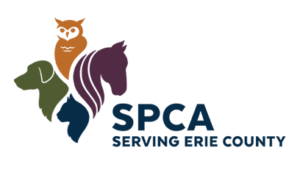 Our SPCA is a local humane society, not financially supported by, or a part of, any other local or national animal welfare group. We are not a branch of the ASPCA. The SPCA Serving Erie County is a New York State Registered Shelter/Rescue, #RR228.